Two in three Australians will be diagnosed with skin cancer by the time they’re 70. It’s a sobering statistic, and one that we urge all of our patients to take seriously. any moles changing in colour, thickness or shape over a period of weeks or months (especially those dark brown to black, red or blue-black in colour). Our team of GPs at Family Doctors Plus is experienced in skin cancer diagnosis and treatment. We have a dedicated skin cancer treatment space with state-of-the-art equipment for excisions. Book a standard appointment with us to have your skin checked. Here are some of the common misconceptions around sun exposure and skin cancer. 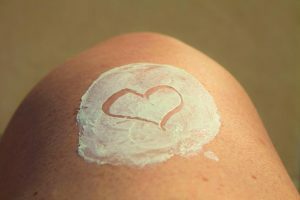 You can read more and find excellent resources for understanding and preventing skin cancer on the Cancer Council Australia website. While sunburn causes 95% of melanomas (the most deadly form of skin cancer), sun exposure that doesn’t result in burning can still damage skin cells and increase your risk of cancer. Evidence suggests that regular exposure to UV radiation year after year can still lead to skin cancer. We all should know by now that there’s nothing healthy about a tan, but misconceptions persist about fake tanning products. A fake tan will not provide you with protection against UV radiation, so you still need to take the usual sun protection measures. Nope! In January 2016, all commercial solariums were banned in all states in Australia. They emit UVA and UVB radiation – both known to cause cancer. Don’t be fooled by cooler or overcast weather. UV radiation can be just as strong on these days, and you can still get sunburnt. half a teaspoon for the face, neck and ears. Use broad-spectrum, water-resistant SPF30+ sunscreen, applied 20 minutes before you go outside and every two hours after that. use a broad-spectrum, water-resistant sunscreen on any sun-exposed skin. There is no evidence that using sunscreen on babies is harmful. Try sunscreen milks or creams for sensitive skin to minimise the likelihood of irritation. If any unusual reaction occurs, discontinue use of that product.